Applying for large scholarships is a long and tiring process, making sure that every moment of your academic life is in your application and then compress every information in two pages. Finally, proofread it by friends and colleagues. It is a busy week until October 1st, the deadline. I have organized a free-for-all collective cooking last Friday, and sent at least 20 invitations among colleagues, it ended up to be only 4 people. At first, I thought it will be a disaster, at least my French colleague came to the rescue when his Friday's event was cancelled. 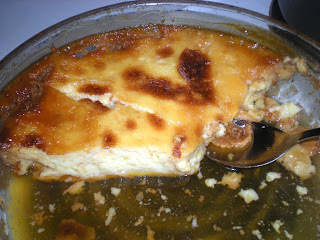 Here is one of his frequent dessert...coconut flan, a simple 4 ingredient recipe. This can be served warm or cold. 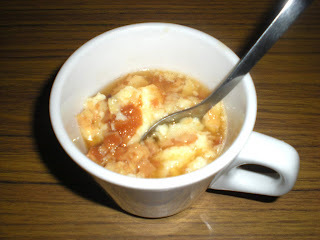 The tricky part is to caramelize the sugar, here is a hopeful video. 2. 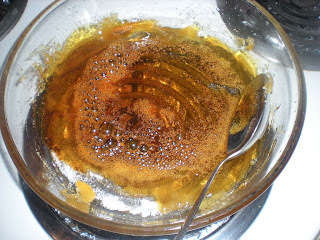 Caramelize the sugar in a medium saucepan or directly on a 9'' Pyrex cake mould over medium-low heat. 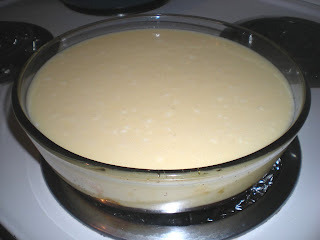 Once melted, pour immediately the caramel to the cake mould. 3. Beat eggs in a medium bowl. Add milk, coconut milk and sugar until dissolved. 4. Pour batter on top of the caramel. 5. Bake for 20 mins or until golden. Serve warm or cold.